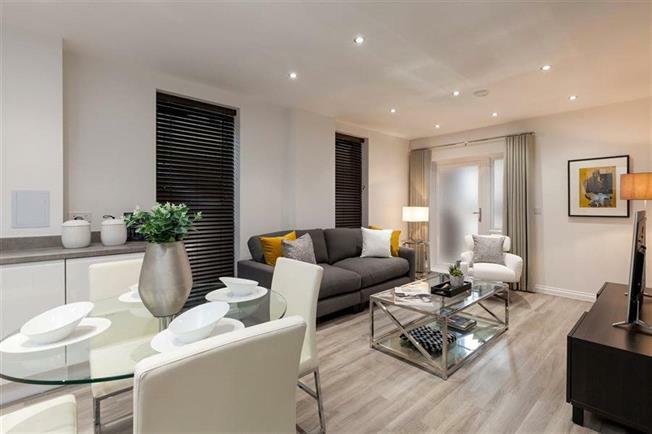 1 Bedroom Flat For Sale in Whetstone, London for Asking Price £399,995. A 1-Bedroom Ground floor apartment offering a fantastic living space, ideal for first time buyers. With an open-plan Kitchen/Living/Dining area, this home provides the perfect space for entertaining. - Contemporary kitchen by Symphony with soft-close doors and drawers, Laminate worktop with matching upstands, Stainless steel 1½ bowl with drainer and Chrome mixer taps. AEG appliances to include stainless steel single oven, 4-burner stainless steel gas hob, Stainless steel splashback to hob, AEG stainless steel chimney hood, Integrated dishwasher, Integrated fridge freezer, Integrated washer/dryer. Chrome low-energy downlighters, Under-cabinet lighting. - Bathroom with white sanitaryware and Walnut coloured vanity top. Chrome towel rail. Chrome low energy down lighters. Half-height tiling to all walls, Full-height tiling to shower enclosure in Ensuite that have either Thermostatic or Electric shower. - 2-year Taylor Wimpey warranty.